The 2010 FIFA World Cup is due to kick-off in South Africa on Friday, 11th June, with England's opening game being on Saturday, 12th June against the USA in Rustenburg. 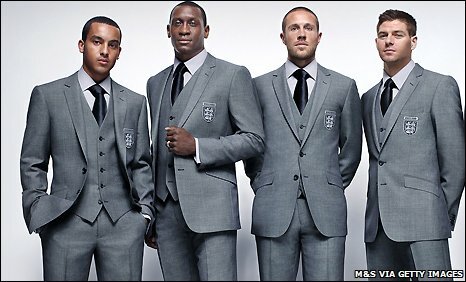 The team flew out to South Africa last week after posing for a photo shoot in their new Marks & Spencer suits. The England team have shown off their official World Cup suits - and there is more than just a hint of 1966 in the design. Forty-four years ago, Sir Alf Ramsey's World Cup winners sported an ensemble with thin lapels and narrow trousers - a look England manager Fabio Capello was keen to see repeated. With this in mind Marks & Spencer has created the official FA suit to specifications set by the England Manger and created though a collaboration between tailor Timothy Everest MBE and M&S. The two-button single breasted jacket is sculpted to a modern British block with sleeve head roll shoulders for a classic fitting, slim silhouette. Additional styling details include narrower lapels, slanted pockets, four button cuffs and a decadent red puppy tooth check lining. Trousers are flat fronted and half lined providing an elegant modern shape. The waistcoat gives added style kudos and maintains the refined look. 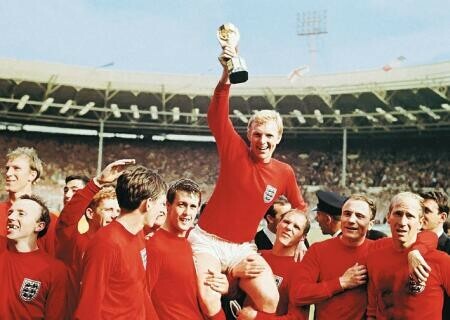 I have to say overall the suits look very good and will hopefully inspire the team on the pitch to the former glory days of 1966, being the only time that we have won the competition. Some of you across the pond may remember Marks & Spencer for their disastrous takeover of the American men's clothier chain, Brooks Brothers in April of 1988. Thankfully Brooks Brothers has since re-established itself, as has M&S. The FIFA World Cup, also called the Football World Cup, but usually referred to simply as the World Cup, is an international association football competition contested by the men's national teams of the members of Fédération Internationale de Football Association (FIFA), the sport's global governing body. The championship has been awarded every four years since the first tournament in 1930, except in 1942 and 1946 when it was not contested because of World War II. 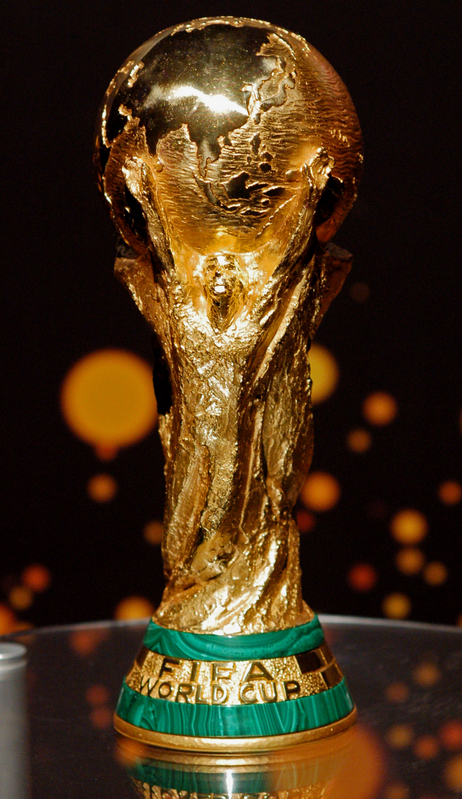 The current format of the tournament involves 32 teams competing for the title at venues within the host nation(s) over a period of about a month – this phase is often called the World Cup Finals. A qualification phase, which currently takes place over the preceding three years, is used to determine which teams qualify for the tournament together with the host nation(s). All of you looking fabulous.. I think they need an RVR tie! Wouldn't hurt for them to get fitted by Steed either!